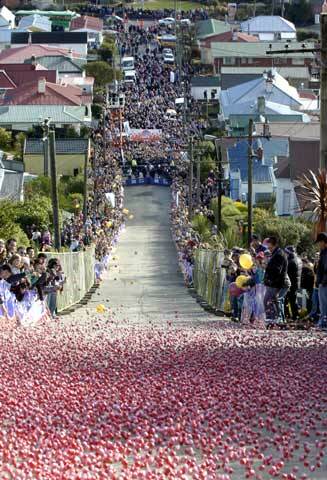 A record number of Jaffas (chocolate-centred orange sweets) – 30,000 in all – rolled down Dunedin’s steepest road, Baldwin Street, on 14 July 2008 as part of the annual Cadbury Chocolate Festival. Jaffas were traditionally rolled down the aisles in cinemas – but not on this scale. Baldwin Street is also the setting for an annual ‘gutbuster’ race up the street and then back down, usually in late summer.